Thank you for reading our blog and supporting our initiative! We're not stopping, and we're not slowing down. On the contrary, we're gearing up to provide you with more content than ever before! To do this, we've found a platform that we think you'll enjoy if you haven't already discovered it, Tumblr. We've already got our CBC Diversity Tumblr up and running and invite you to check out our new look. After this week, we will no longer be updating our CBC Blogger page, however, all the past posts and resources will still be available for viewing on this site. We've transferred all of the last year and half onto our new Tumblog and plan to continue providing thought-provoking new posts, series, resources, and more in our new home. **Please note that on Monday, Oct. 28th, 2013, the proper address to reach CBC Diversity's Blogger page will be cbcdiversity.blogspot.com. Cbcdiversity.com will take you to our Tumblr page. When you were a child or young adult, what book first opened your eyes to the diversity of the world? I didn’t read books as much as I should have. I struggled with comprehension and retention. 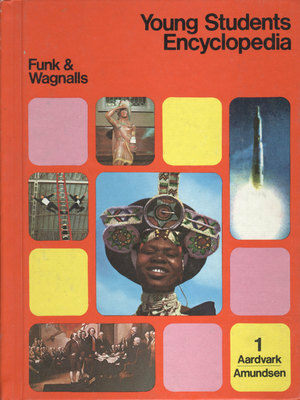 There was plenty of Dr. Seus and Mother Goose around the house, but I preferred our Funk & Wagnalls Young Students Encyclopedias. That’s where I discovered a multicultural world. As a child, I thought the world was white. That’s what my world looked like growing up in Des Moines, Iowa in the 1960s and 70s. White people, white books, white movies, white television, white music. Encyclopedias allowed me to see the world from another vantage point. They revealed a world made up of color -- brown people of every shade. Maybe that’s why encyclopedias appealed to me so much. What is your favorite diverse book that you read recently? I’m a little confused about the term ‘diverse book.’ It's one of those uncomfortable, elephant-in-the-room terms, that used to mean one thing, but has morphed into something entirely different. It’s an industry code word whose definition still evolves. I’ve illustrated children’s books for nearly 30 years -- trade and educational. When I entered the business back in the 80s, people used the word ‘diversity’ interchangeably with Black or African-American. When someone said ‘diversity,’ I knew they were talking about me. I was often hired to illustrate a text because an editor had a ‘diverse,’ ‘multicultural,’ ‘African-American’ manuscript. However when I hear the term used today, it’s more inclusive, as should be. When someone says ‘diverse,’ they could mean African-American, Hispanic, Asian, Native, LGBT, girls/women, mixed-race, physically challenged, Buddhist -- or even white. A better question might be: What is a favorite book that exemplifies diversity? But even that would be a difficult question because I don’t think diversity can be about one or two books. It’s about a body of books: Heart & Soul; Diego Riveria; Dreaming Up! ; Around our Way on Neighbor’s Day; Alvin Ho; Jingle Dancer. There’s so many. The books you read as a child are as real as the places you live in or the people around you. They whisper to you of the possibilities the world can offer, like mental pathways into your own as-yet-unlived future. In that category, Rumer Godden gave me permission to write. Kipling both enchanted and troubled me; only many years later did I understand my own need to write about the country he depicted with his strange colonial mixture of tenderness and disdain. 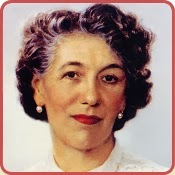 But as a child of the late 1950s growing up in India, I cut my reading teeth on Enid Blyton. I learned a lot from Enid about humor, family, friendships, and the pleasure of racing along a swiftly unfolding plot. Now, thinking back, I am pretty sure that I also learned how not to write dialogue. Guest post by educator and writer, Cory Silverberg. The publisher Lee and Low recently mobilized social media (through the nifty infographic on the left) to jumpstart a discussion of diversity in children’s literature. 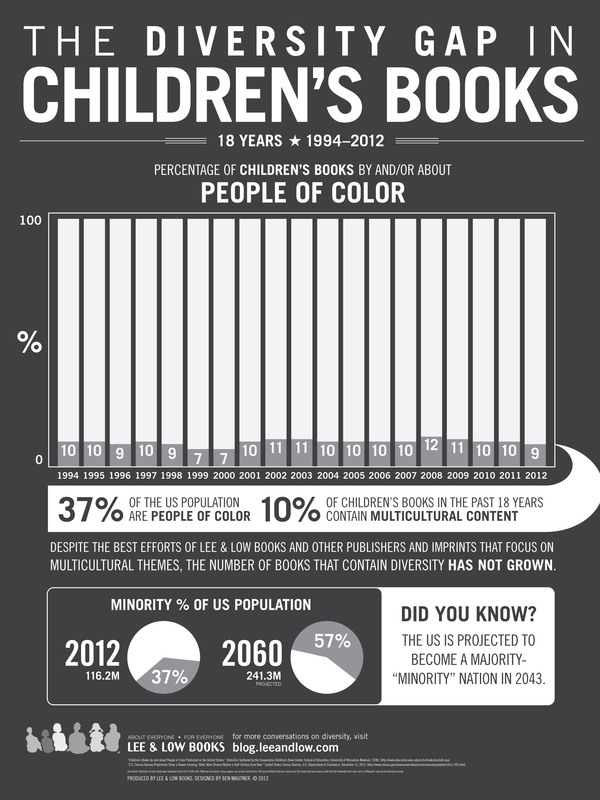 No surprise to anyone who is paying attention, while the US continues to undergo a significant demographic shift, diversity in children’s books is not reflecting what we the people look like today. When we grow up not finding ourselves represented in popular media and educational curricula it becomes just a little harder to creatively imagine our futures, to explore our identities, to try on different ways of being; all of which are essential aspects of development. Shame thrives in invisibility and silence. This is why representation is a critical aspect of diversity work. But we need to also be mindful of how easily a complicated idea like diversity becomes code for one flattened out thing. That thing is usually the visual representation of race. As authors and educators, editors and publishers, we need to notice how this is missing the forest for the trees. So as publishers start identifying even more specific ‘diversity markets’ and begin to make editorial “requests” to meet them, it seems like a good time to consider both the forest and the trees, and think about whether there’s a way to tend to both. To accomplish this we need to think not only of diversity but also of inclusion. Share book reviews and ratings with CBC Diversity, and even join a book club on Goodreads. CBC Diversity Blog maintained by Ayanna Coleman. Watermark theme. Theme images by sebastian-julian. Powered by Blogger.